Woe is us! Fathers Day spending down in 2009. Home » Activities » Woe is us! 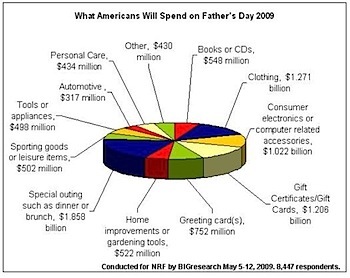 Fathers Day spending down in 2009. Yes, dads, don’t expect quite as many ties or chocolates this Fathers Day. Your celebration is yet another victim of the recession. However, note this: while moms “get” more on Mom’s Day per capita, spending on moms in 2009 was expected to be down 10% while spending for dads only will dip about 5%. Consumers will spend the most ($1.9 billion) on a special outing such as a dinner or even a sporting event. Clothing still ranks high among gift givers who are expected to spend $1.3 billion on new socks, slacks and ties. Others will treat dad to a gift card ($1.2 billion), electronics ($1.0 billion), books or CDs ($548 million), home improvement items ($522 million) and sporting goods ($502 million). Discount stores and department stores will be going head to head this Father’s Day as 33.9 percent of Americans plan on shopping at discounters and 33.7 percent will shop at department stores. Others will head to specialty stores like electronics and home improvement stores (26.8%), online (17.9%), at specialty clothing stores (6.1%) or through a catalog (2.8%). The majority of those surveyed said they will only buy for their father/stepfather (51.1%). Husbands (28.6%), sons (7.6%), grandfathers (4.7%) and brothers (5.1%) will also see gifts from family members. In case you haven’t picked out a gift, there are some helpful gift categories in the chart form the National Retail Federation.